...because most of us don't have all day to spend in the kitchen! « Hearty Split Pea Soup..shhhh-it’s fat free! Here’s a secret: until a couple of days ago, I’d never tasted a quiche. As I’ve previously mentioned, I’m a perpetual dieter. As such, the typical fattening quiche baked in an even-more fattening crust has always been off limits to me. So I folded the wraps into neat little cups, and half an hour later a family favorite was born. The best part? My non-dieting family members liked this as much as I did! I might have forgotten to tell my family how healthy they are. Oops. Sauté the onions in a small amount (about a tablespoon) of oil. When translucent, add the garlic, salt, pepper, cumin and paprika. Sauté another couple of minutes until soft and fragrant. Set aside to cool. Meanwhile scramble the eggs in a large mixing bowl until yolks and whites are completely incorporated. Add the shredded cheese and cottage cheese, stir to combine. Add the bread crumbs and milk, and stir until mixture is smooth. Add the onion mixture and mix well. Spray your muffin pans with Pam. Press the wraps into the cups, folding over to line the cup neatly. Spoon your mixture into the wrap cups, fill the entire cup. Sprinkle a few pieces of shredded cheese on top. Bake at 350 for 30-45 minutes, until they feel firm to the touch. (The baking time will depend on the size of your cups, and the amount of mixture in each cup.) If you’d like the cheese to brown more on the top, put the pan under the broiler for a minute or so- watch carefully to prevent burning! These look gorgeous and delicious! I will have to make them sometime when I’m feeling ambitious. Wow..healthy quiche..Now who wouldnt like that? I am totally bookmarking this. 🙂 Thanks for the recipe? Hi CC- thanks for stopping by! I’m glad you like the recipe- let me know how it comes out! I’ve got lots more super healthy recipes up my sleeve; stay tuned! Simply genius to use the whole wheat wraps! Wow! This is a great idea! 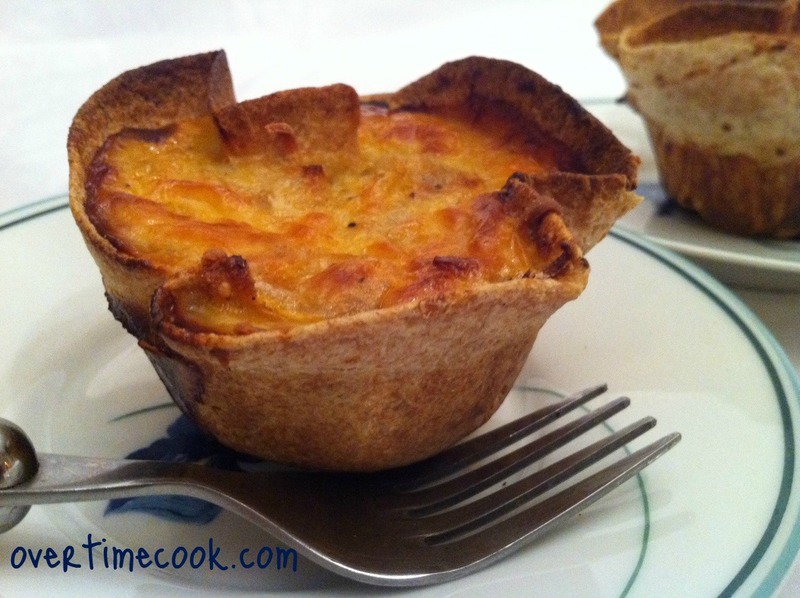 I have been looking for some great quiche recipes!! Thank you! do these have to be made fresh or do they freeze well? I don’t think I’ve ever frozen these, but I’ve kept them in the fridge for a couple of days and they reheated nicely. If you do freeze them, let me know how it turns out! I often make a kind of quiche but without any base. Mainly it’s like a Spanish omelette or it is also called a kuku. Basically beaten eggs – with added milk or water plus optional additions depending on whether it is for a milk or meat meal: fried onions, chopped peppers, diced potatoes, spinach, peas, diced sausage. Can be served hot or cold – and great for picnics. would this recipe work in a 9 inch round pan instead of individual cups? All images and content on this blog are copyright protected. Please do not use any of the photos on this blog without prior permission. All work on this blog is a result of my hard work and is my property – don’t steal! If you have any questions, feel free to contact me.